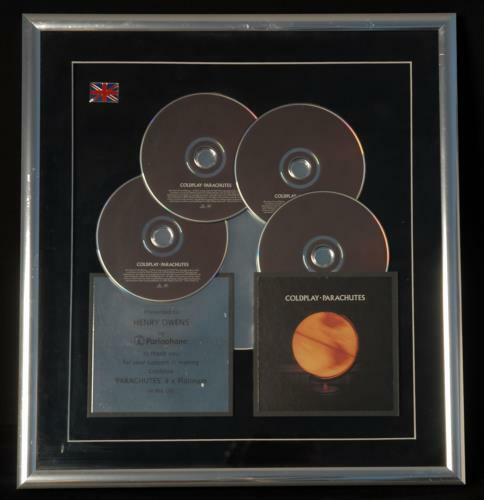 COLDPLAY Parachutes (Rare 2000 official UK Parlophone in-house 4 x PLATINUM sales award disc issued to commemorate sales in excess of 4,000,000 copies of the album. Features four copies of the CD album arranged above the custom platinum dedication plaque and sleeve artwork, with mini 'Union Jack' flag in the top left corner. Measures approximately 16�" x 15�" - framed and glazed. A truly stunning item! ).